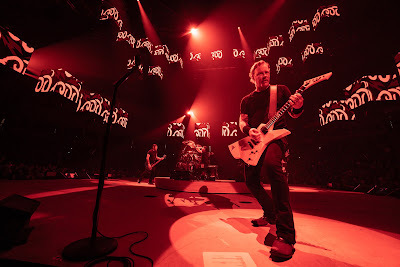 Metallica are streaming official video of a performance of “Hardwired”, from a January 20 show in Little Rock, AR. The band’s tenth album debuted at No. 1 on the US Billboard 200 on its way to sales of more than a million copies in the US. Metallica are also streaming another “Hardwired…” track, “Moth Into Flame”, from the Little Rock concert, which marked the band’s second full live date of the year following a month-long break over the Christmas holidays. The group will wrap up the winter North American trek in March before enjoying a break and launching a full summer series of European shows in Lisbon, Portugal on May 1. Metallica recently delivered the No. 5 Rock News Story Of The Year as part of the 2018 hennemusic Rock News Awards.